A Colorado native, he was raised in Greely, Colorado. Dr. Foulk received his medical degree from the University of Nebraska College of Medicine. He then completed his internship and residency at the University of California – Davis Medical Center in Sacramento, California. He received his fellowship training at the Methodist Sports Medicine Center under, renowned orthopedic sports medicine specialist, Dr. K.D. Shelbourne in Indianapolis, Indiana. 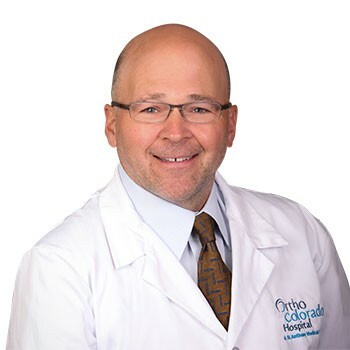 Dr. Foulk has authored book chapters and scientific papers in the area of Denver orthopedic sports medicine and has presented at the local and national level on sports medicine topics. In his free time, Dr. Foulk enjoys biking, skiing, golf and traveling to visit his three children who live across the United States. Dr. Foulk sees patients at Panorama’s offices in Golden and Westminster. Jessica is a Colorado Native. She grew up in Boulder Colorado. She attended school at Kettering College of Medical Arts in Ohio. She enjoys working in Sports Medicine and works with Dr. Foulk and Dr. Robinson. In her spare time, she enjoys Mountain Biking, Hiking, Traveling.